A new report on child health and climate change, released by Doctors for the Environment Australia (DEA), warns that Australia’s federal and state governments must take immediate steps to curtail rising global temperatures or risk an increased burden of disease, particularly for children. The report, No Time for Games: Children’s Health and Climate Change, presents key research findings that predict a frightening future for children and the healthcare system. Released ahead of the federal government’s soon-to-be released emissions targets, which the government will take to the December UN climate change conference in Paris, the report coincides with moves by the AMA to revamp its climate policy and pressure the government to take more action on climate change. AMA president Associate Professor Brian Owler has announced the establishment of a working group that will encourage doctors to take a more active role in mitigating climate change. The DEA report includes recent research linking climate change threats such as extreme heat, severe weather events and air pollution to increasing instances of children’s asthma attacks, fever, gastroenteritis, premature birth, infections, leptospirosis, dengue, drowning, hypothermia and electrocution. It also records the mental and emotional distress documented for children and adolescents following weather disasters, including post-traumatic stress disorder, sleep disturbance, aggressive behaviour and substance abuse. All this is complicated by children’s need for specialised medical care that recognises their differences in size, bodily systems and psychology, the report says. Professor Stanley, who wrote the foreword to the report and launched it in Perth on Sunday, says failure to act responsibly on the issue of climate change will have “dire consequences for our children’s wellbeing”. “[And the] impacts of inadequate action for their children verge on the apocalyptic and are too scary to contemplate,” she said. “This report makes it clear that Australia must be prepared to adapt our care of children to the threats our young people are experiencing as a result of climate change. The DEA report says children are disproportionally affected by the health effects of climate change because of their dependence on others. Children’s ongoing brain development also makes them more vulnerable to the emotional trauma and mental health effects of bushfires, floods and droughts. The continued burning of fossil fuels also causes significant harm to children via air pollution. According to the Australian Institute of Health and Welfare, more than two million Australians have asthma. This relatively high number could be partially explained by increased exposure to allergens in the air as a result of climate change, the report argues. It says that in a promising step, the recently launched US emissions reduction policy is expected to avoid up to 6600 premature deaths, 150,000 asthma attacks in children, and 2800 hospital admissions. Australia should commit to supporting and financing the pursuit of low-carbon development paths, DEA says. The federal government’s current commitment of $200 million towards the UN’s climate change program is “commendable”, but is not a fair contribution to the UN’s target of $100 billion annually by 2020, the doctor group writes. • Government measures to help health and emergency services prepare for the demands placed on infrastructure by climate change. 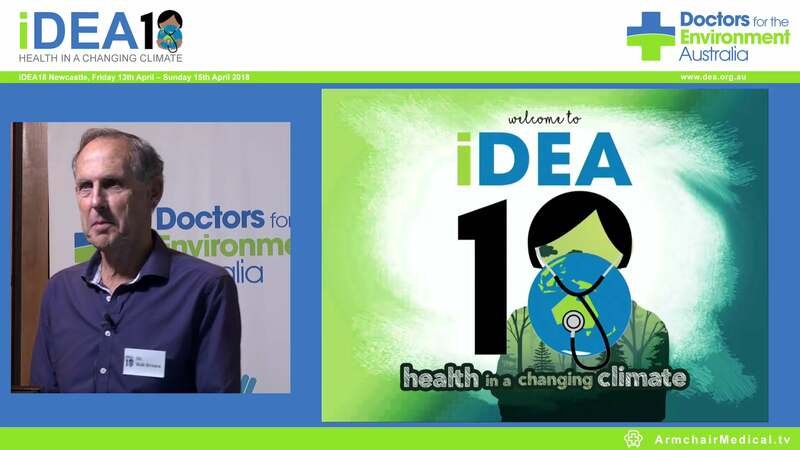 At the AMA national conference in Brisbane on Sunday, Professor Owler said the government should prepare for the significant health consequences of a warming climate, with moves including the establishment of a centre for disease control. Medical Observer, 1 June 2015, and republished with their kind permission.